Lobby Lounge, Jalan Imbi, Kuala Lumpur. DON’T just stop at breakfast and later dive into a high-calorie dinner because you are hungry by then. Dietitians would agree that it is neither good for the buttocks, nor your mood. Personally, I get really cranky when I am hungry, and if the situation is not tended to soon, hunger makes me irrationally angry too. A good lunch has a way of carrying you through the day and spending it with someone or a few people can really make a difference in work productivity, relationship or simply keep you happier. Just be strong to ward off that 15 minutes of evil, after-lunch slumber and you may well be on the road to a fulfilling day. If you are around Jalan Imbi or Bukit Bintang during lunch, you may want to check out Ritz-Carlton Kuala Lumpur’s Roast Of The Day promotion at its Lobby Lounge. Priced at RM95++ per person, the three-course meal seems pretty interesting with its daily menu. It is served between noon and 2pm from Monday to Friday. The main course comes with a soup and desserts. You can pick pretty tarts, cakes and jellies from the dessert trolley. During a recent lunch break at the lounge, I found there is a special deal for every working day. 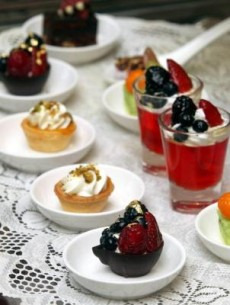 Sweet tooth : Some desserts from the spread. Slow Roasted Leg of Lamb on Mondays, Salmon en Croute on Tuesdays, Whole Roasted Tom Turkey on Wednesdays, Salt-Crusted Filet of Black Cod on Thursdays and Fridays are reserved for the Slow Roasted Wagyu Rump. I was in on a Wednesday. It was a turkey day but due to some reason, I was served the beef, which wasn’t too bad. 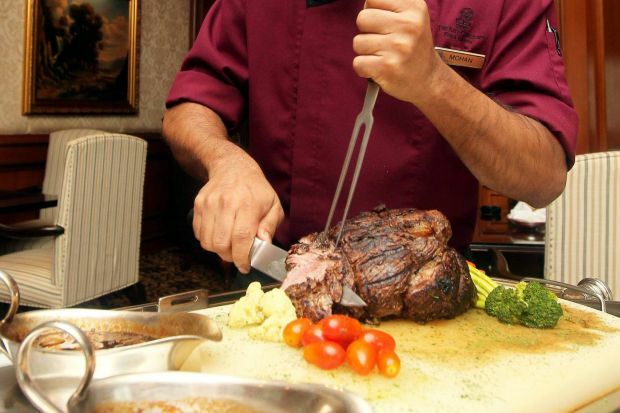 “Would you like something well-done, or medium?” asked Chef Mohan K. Deligannu, 31, as he was carving the rump in front of us. Slurp! 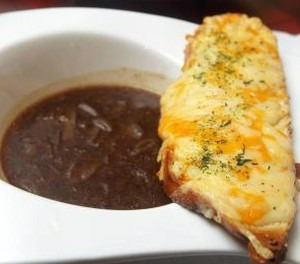 : The delectable French Onion Soup comes with a cheese-covered toast. Opting for a few slices of medium-done beef, my serving came with broccoli, carrots and asparagus and tomatoes. The gravy was some bone-marrow juice, which the kitchen had taken time to prepare. “It is a lengthy process but we still do it because it is good,” said Mohan. Soup of the day was French Onion Soup and a serving of cheese-covered toast. Other soups of the day range from Tomato Soup, Cauliflower and Blue Cheese Soup to Wild Mushroom and Truffle Soup. The hotel’s public relations manager Oliver Ellerton said the hotel had kicked off the promotion to tell people that the lounge also served food for lunch apart from its Sunday Roast. “We think there is a market here for this. People don’t know that they can come here for lunch for this quality of food and at this price,” he said.